Give the Gift of Riding to a Student. Each lesson is $40, and it is Kids & Horses’ goal to never turn away a student due to lack of funds. Your donation to our Scholarship Fund allows all students to ride. $ 40 will allow one scholarship student to ride in one lesson. 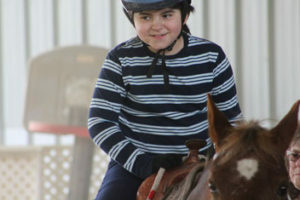 $ 80 will allow one scholarship student to ride in two lessons. $ 120 will allow one scholarship student to ride in three lessons. $ 160 will allow one scholarship student to ride in four lessons. $ 200 will allow one scholarship student to ride in five lessons. $ 240 will allow one scholarship student to ride in one six-week session. $1,440 will allow one scholarship student to ride for one full year.